Welcome to the homepage for the Okinawan Traditional Goju Ryu Karate-do Association. The aim of the Association is the transmission of Okinawan Goju Ryu Karate-do as taught by the founder of Okinawan Goju Ryu, Miyagi Chojun Bushi. 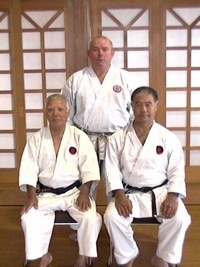 Our Chief Instructor Sensei George Andrews, 8th Dan IOGKF, has been studying the arts for over 50 years (since 1967) and is the highest graded student of Sensei Higaonna Morio in Europe. He regularly teaches in many European Countries. As an Association we hold courses around England throughout the year. These courses cover all aspects of Okinawan Goju Ryu and are open to all styles regardless of grade or affiliation. Children's classes with Sensei George Andrews at the full time dojo in Peckham, South London.